Heels Down is a unique, full-day program of equine pursuits. This program is geared to individuals with not only a true love of horses, but the energy and commitment to sustain a full day of horse activities and lessons, both mounted an un-mounted. This in-depth program is designed for campers with previous experience who are looking to take their riding to the next level. Enrollment is per 2-week session to allow for more individualized training and to ensure accelerated progress. Campers in the Heels Down program should have a minimum of one year experience riding and a solid walk/trot proficiency. Parents of children who have not attended PFDC are asked to phone the office for prescreening interview to assure suitability for this program. Mounted Instruction (Topics include but are not limited to) Dressage, Carriage Driving, Vaulting, Gymkhana Games, Show Jumping, Trail Riding, Intro. to Eventing and Riding Cross-Country. Un-Mounted Instruction is a unique feature of our Heels Down programming, we include but are not limited to such fascinating subjects as Saddle Fitting, Fitness for the Equestrian, Yoga, Water Conditioning and Horse Nutrition. By reviewing your foundations of riding, our instructors will encourage you to increase your skills and confidence. Using their wide range of backgrounds and experience, they will teach a complete balance of horse and rider using natural and artificial aids. Heels Down instructors teach safe practices that promote direct and clear communication between horse and rider. This is the foundation needed for competitive riding, regardless of the discipline your child may pursue and is even beneficial for those interested in recreational riding. The Heels Down curriculum provides additional opportunities that are not frequently offered in regular lesson programs. These topics may consist of trail rides, gymkhanas, drill teams, games and most importantly the subject matter covered by our visiting professionals: Horse Health, Vet Science, Dentistry and Hoof Care. What sets Heels Down apart from other basic programs, is that campers are treated to outside visiting professionals’ expertise, who teach them about the medical side of horse care. Heels Down participants have the exclusive opportunity to watch and help the vet with routine visits, and discuss with the dentist such topics as the necessity of filing horse’s teeth. Regular visits with our farriers, also teach campers the importance of correct shoeing for all different horses and environments. This subject is certainly a necessity when stabling your own horse, but it is not a primary focus for the Heels Down program. The participants learn about feed, turn-out, and first-aid, by observing and discussing with staff who are assigned to these hands-on duties. The Heels Down program affords campers the unique opportunity to learn from true professionals in various horse related fields. Included in past summers have been instructions in vaulting, horse massage, dressage, eventing and carriage driving. Our most noted professionals have represented carriage driving including, Sue Rogers, the 2005 World Single Combined Pony Driving Champion, who has shared her knowledge with our Heels Down campers. We are also honored to have Marc Johnson, a member of the American Driving Society and a participant in the 1993 World Championships. Since 2008 Marc has shared his expertise with our Heels Down participants in the technical sport of combined driving. Our Haflinger ponies have been an integral part of our growing driving team. PFDC uses these gentle ponies as well as minis to teach the campers how to drive a cart and introduces them to the world of combined driving, including dressage, hazards, and cones. Pacific, Bennington and Tidholm carriages, driven by the Heels Down campers, are of the highest quality construction. Often when we think of riding, instructors place their emphasis on the conditioning of the horse, forgetting the key element, the rider. With the inception of Heels Down, this factor was included as an integral building block to the program. Our specialized yoga program demonstrates to riders how to stretch and manipulate their own muscles to improve their flexibility and balance on the horse. Additionally, our inventive water conditioning element, taught by a certified instructor, is held in the heated pool, allowing riders to cross-train their riding muscles in a fun and refreshing way. Not only are our riders strengthening and aerobically conditioning themselves, but it is a wonderful opportunity to be rejuvenated from the heat of the day. The Heels Down instructors are hired specifically for their vast personal experience and thorough knowledge of horses, riding, training and teaching skills. Although we have approximately an 80% return rate for our Day Camp riding instructors, Heels Down is far more specialized. We are constantly in quest of the best instructors we can find from area professionals, competitive colleges and recommendations within the riding community. Working closely with international agencies, who provide highly qualified instructors, Heels Down is able to choose from the elite of the riding world on a global basis. For more details about this program, contact the office to speak with the Director. This is an entry-level program for youth seeking the full day experience with horses. The goal of each session is to have your child independently riding at the walk and trot and be able to leave Pompositticut after a 2 week session and join a group lesson at any local equestrian facility. Established in 1980, this nationally accredited camp program, provide a highly specialized session under the supervision of qualified licensed instructors who furnish individualized attention, second to none. 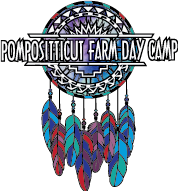 Pompositticut is a well respected summer camp experience, providing the initial foundation for future riders, with an intimate enrollment of 8 participants, 8-12 years old. No previous riding knowledge is required for this program. However, riders 6-7 years old may be eligible for enrollment provided they complete 10 weeks of spring lessons and have attended the day camp for at least 2 sessions. While the Short Stirrup program will be geared to producing an independent walk/trot rider, it is also geared for campers who are already walking and trotting. Our instructors will continue to progress these skills and advance their knowledge of riding and horsemanship, ultimately guiding them to be eligible for our most noted equestrian program, Heels Down.